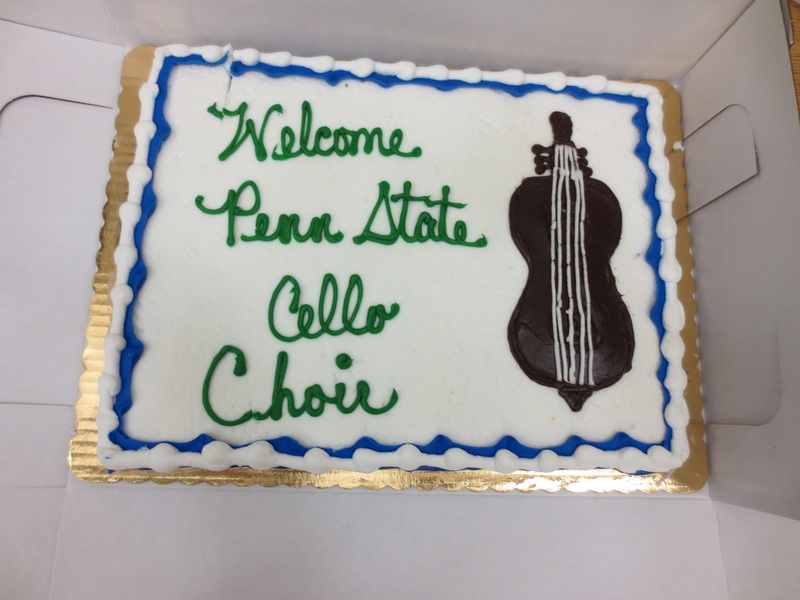 Welcome to the cello studio at Penn State! 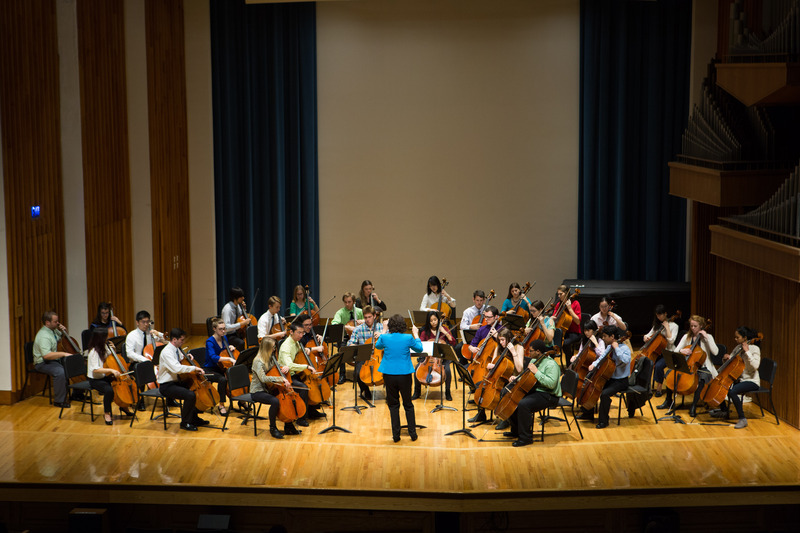 The string program has enrolled excellent students from all over the United States, as well as from Argentina, Brazil, Ukraine, Germany, Bulgaria, Israel, Jordan, Taiwan, China, Colombia, and Brazil. The cello studio is vibrant, with weekly performance classes and guest master classes. Cello students have won the Penn State Concerto Competition resulting in performances of concertos by Dvorak, Elgar, and Saint-Saens, Tchaikovsky (Rococo Variations) and Bloch (Schelomo) with the Penn State Philharmonic. We have hosted cello master classes with Anner Bylsma, Paul Katz, Colin Carr, Alan Harris, Aldo Parisot, Ralph Kirshbaum, Desmond Hoebig, Alisa Weilerstein, and David Finckel, as well as chamber music classes with members of the Tokyo Quartet, Kronos Quartet, Emerson Quartet, and Pinchas Zuckerman. This year, our cello choir has 30 members. 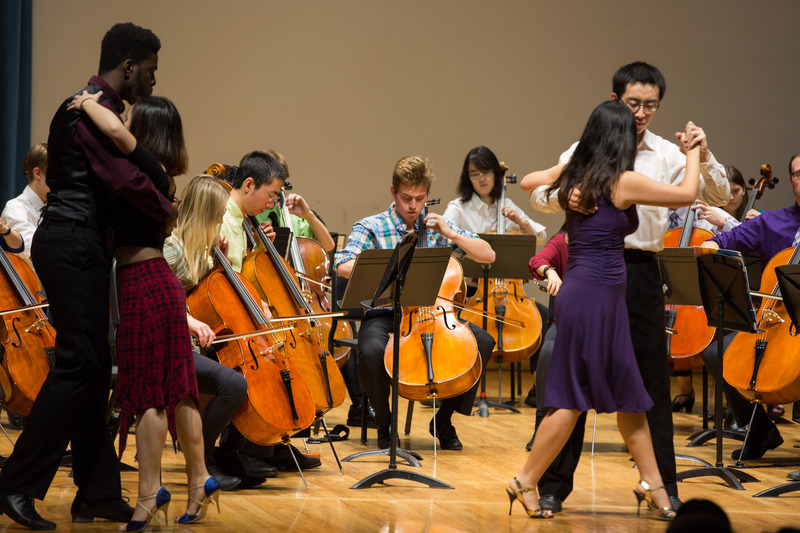 Graduates of the cello studio have been offered assistantships from many prestigious institutions, and former students are currently employed as performers and teachers in Croatia, Sweden, Germany, Taiwan, Brazil, and the United States. For more information please contact Professor Cook at kdc3@psu.edu. "She is supportive, enthusiastic, and meticulous"
"Ms. Cook is an excellent teacher. She works on technical aspects of my playing that help me progress. She is great at demonstrating these techniques and I feel like I've become much more aware of my bow hand and producing the best sound possible"
"She is extremely patient and positive." "Amazing teacher! Very encouraging, extremely knowledgeable and supportive"
"Prof. Cook has taught me so much about the cello and technique since I started taking lessons with her. She has shown me how to play comfortably through different exercises is is always extremely encouraging and supportive"
"She always creates a kind and supportive environment in lessons and in cello studio class." "Ms. Cook is great at isolating specific techniques and explaining/ showing how to improve the most critical elements of cello playing." "She was able to change her method of teaching when I wasn't fully understanding a concept. She encouraged me when I was struggling with something. " "Ms. Cook is extremely effective in helping me progress in cello technique. I look forward to my lessons with her each week. " "She is the best cello teacher I've ever had"
"Thank you very much for letting be part of this beautiful experience. I do not have words to express how important this is for me and how much I appreciate the fact that I could play the cello in the Cello Choir with you being the conductor. Thanks to you I could play the Bachianas Brasileiras, it was a dream come true." 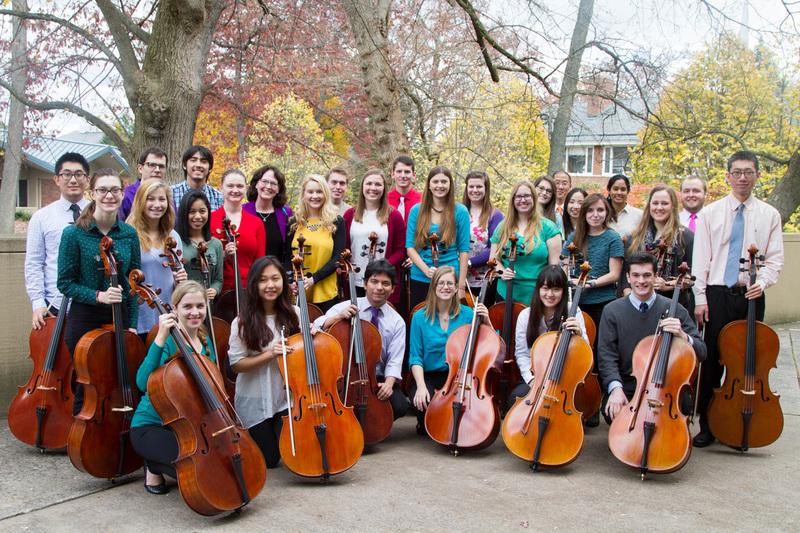 The 2015 Penn State Cello Choir! 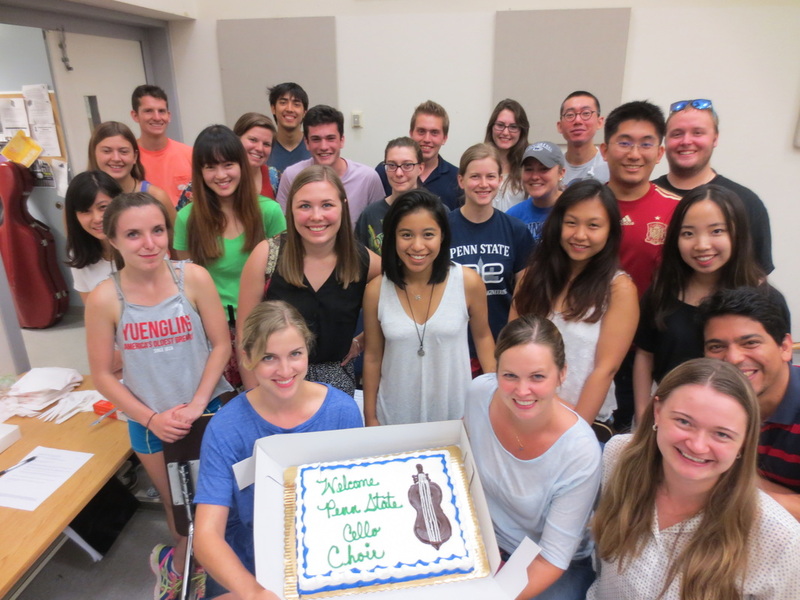 The Penn State Cello Choir was founded in 1992 by Penn State cello professor Kim Cook. The ensemble has performed for the annual Penn State Montage Concerts, the Eisenhower Chapel Bach's Lunch Series and for the Pennsylvania Music Educators Convention in Harrisburg. 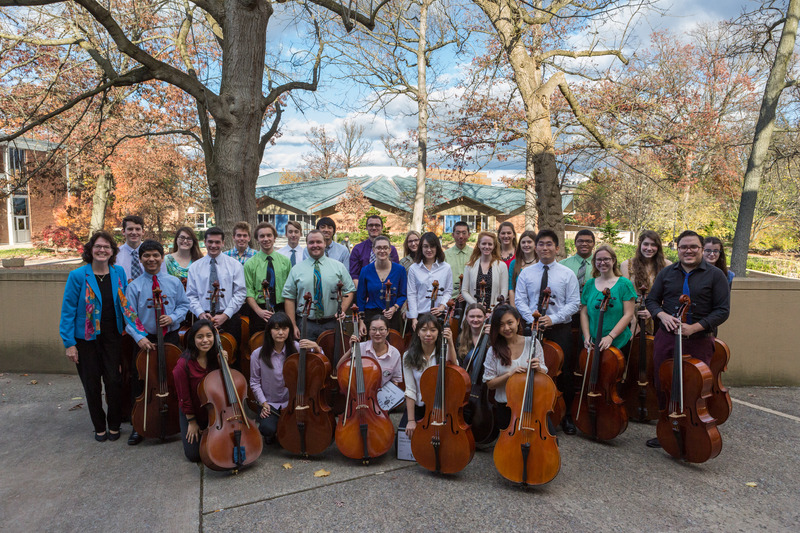 The members of the Penn State Cello Choir have included students from Germany, France, Croatia, Bulgaria, Lithuania, Ukraine, Russia, Israel, Turkey, China, Korea, Taiwan, Brazil, Colombia, Argentina, Trinidad and Tobago, Guam, Puerto Rico, New York, Connecticut, Massachusetts, Pennsylvania, Virginia, Illinois, Florida, Georgia, Texas, and California. Dionne Wright, received a grant from the SURDNA Foundation’s National Artist Teacher, Fellowship, which allowed her to consult with members of the Orpheus Ensemble, create a chamber orchestra and implement the Orpheus method into the rehearsals and performances, VA, faculty member of Chowan University, Governor's School for the Arts, Orchestra cellist with Williamsburg Symphonia, the Virginia Symphony, and the Harlem Symphony, the Arte Musicale Ensemble and Hardwick Chamber Ensemble. Milena Mateeva, section cello, New World Symphony, Michael Tilson Thomas, section cellist for Schleswig-Holstein Festival Orchestra, concerts in Germany, Armenia, Vilnius, "White Nights Concerts" in St. Petersburg (Russia). Brazil, Conductor Christoph Eschenbach 2007-8 and 2008-09 season 4 months of touring, Mahlerjugendorchester, European Youth Orchestra tours conducted by Claudio Abbado, Seiji Ozawa and Pierre Boulez, 15 weeks of international touring during the 1999-00 and 2000-01 season. Renata Tallman, music teaching position, Shenendehowa Central School District in Clifton Park, New York.